We have a gain of 4X in performance which is really nice. The guys at gamevicio.com.br have similar results with the cloth demo. 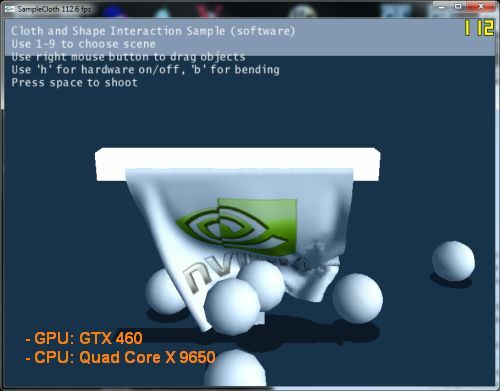 It’s about time PhysX on CPU, Crysis don’t use Cuda and still runs just fine i guess. 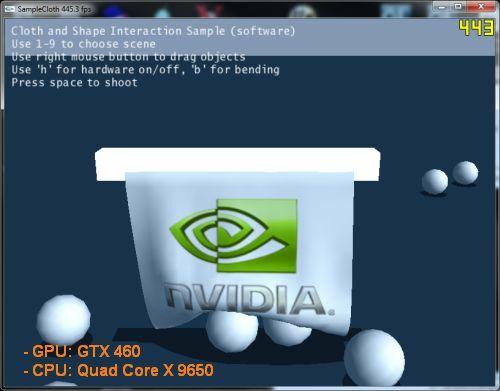 Run´s this demo (hardware)on GPU no-ageia?. In 275? I have demo, but runs “software” no “hardware”. Is the performance gain due to the SSE2 or is there some multithreaded cpu support as well? Can you check your CPU usage JegX? At first sight, there’s no multithreading support. The gpu usage could be because the framerate qudrupled. I mean the gpu has to render 4 times faster no? I guess the same thing would happen in your fluid mark with CPU test and ATI card. If you used multithreading the framerate would jump so the card should render faster and the gpu usage would increase as well. Nuh, don’t worry about it. So what’s the verdict really? Did the performance gain come from SSE2 alone or something else? Have you pinpointed it? Probably is not(completely) related to SSE, the release note says “Optimized cloth simulation on PS3, XBOX 360, PC CPU” and SSE is an instruction set only of x86 CPU.